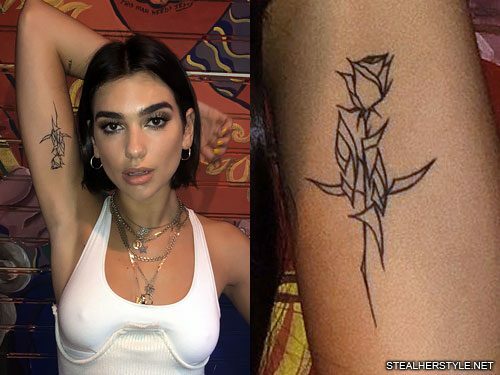 Dua Lipa got this rose tattoo on her right bicep in the wee hours of the morning following her concert in Paris on April 3, 2018. Tattoo artist Madame Buraka has a very distinctive style that combines 90s tribal designs, graffiti, and minimalist line drawings. 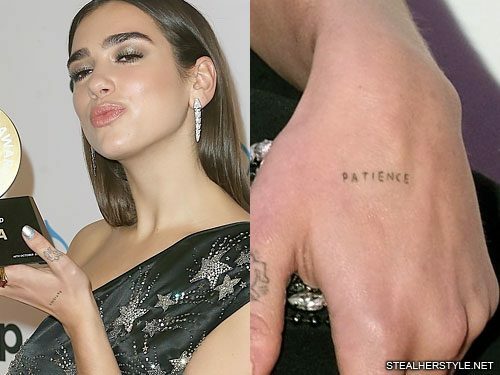 While the lines on Dua’s tattoo may look abstract at first glance, there’s actually an number “95” hidden in the leaves to represent her birth year. 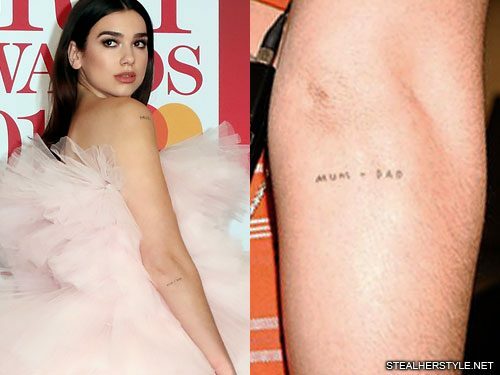 Dua Lipa honors both of her parents with this “MUM + DAD” tattoo on the back of her right elbow. 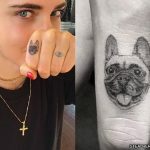 The touching tribute was inked on February 8, 2018 while she was on tour in Los Angeles, CA. Her parents, mother Anesa Lipa and father Dukagjin Lipa, were both on tour with her at the time. 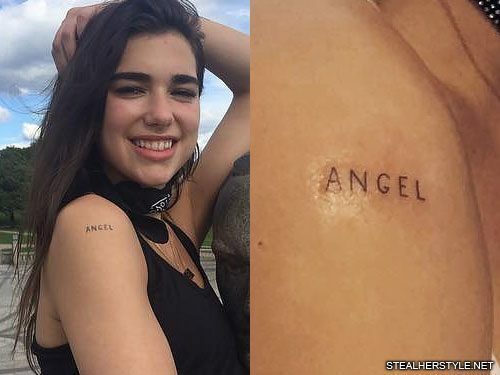 Dua already had the initials of her two siblings, Rina and Gjin, on her wrist so now she has tattoos for her whole family. 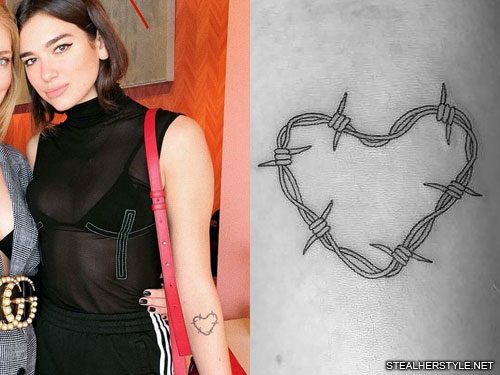 Dua Lipa visited her favorite artist Sean From Texas while she was in Los Angeles in February 2018 and got this tattoo of barbed wire in the shape of a heart. It seems to be a symbol of protecting your heart. 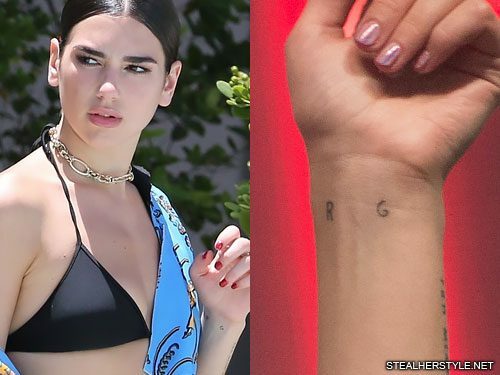 Dua Lipa has the initials “R” and “G” tattooed on her left wrist for her two siblings Rina and Gjin. Dua is oldest in the family, her sister Rina is the middle child, and her brother Gjin is the youngest. 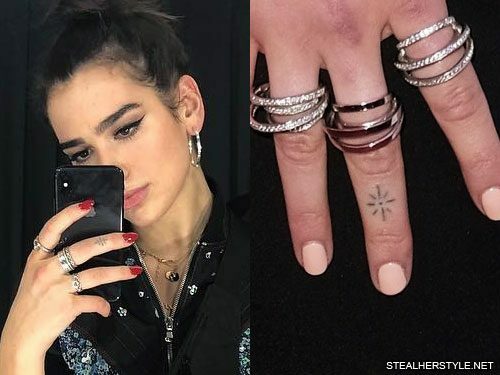 Dua Lipa has a little 8-pointed starburst tattoo on her right middle finger. 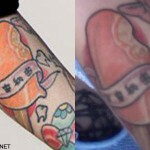 The tattoo is a stick-and-poke given to her by her drummer’s wife, Amy, one day while they were hanging out. Dua Lipa got this homemade stick-and-poke tattoo of an eye in her own kitchen in March 2017. It was done by Amy Bowerman who is the wife of Dua’s drummer William Bowerman. After sketching out multiple versions of the eye on paper, Amy used a needle and ink to tattoo it onto Dua’s inside right ankle. 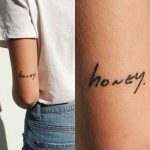 “@williambowerman has come over for dinner and as a house warming gift his wife is giving me a stick n poke tattoo,” Dua Lipa wrote on Twitter. She said the “all seeing eye” is there to protect you. 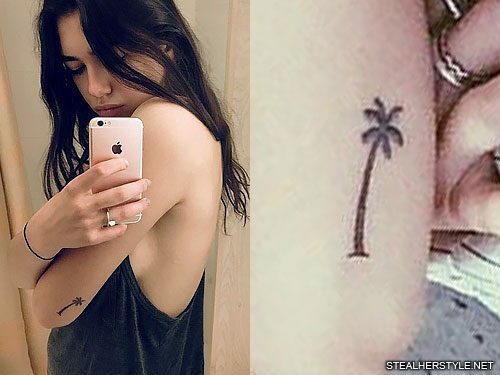 Dua Lipa pays homage to Los Angeles with this palm tree tattoo on the back of her upper left arm. 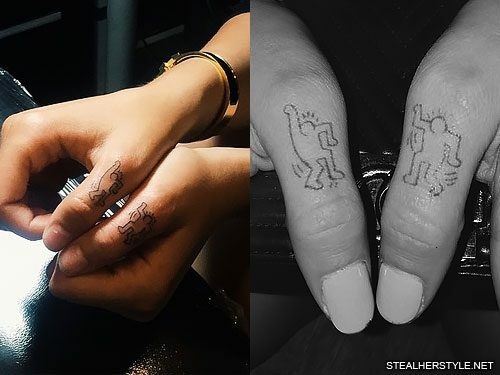 Dua Lipa has tattoos on both of her thumbs featuring dancing people from the works of graffiti artist Keith Haring. “My dancing thumbs! If I can’t afford an original Keith Haring piece (just yet ?) I may aswell just keep it on me!” she wrote on her instagram. 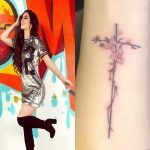 She got the tattoos from her favorite artist Sean From Texas at Tattoo Mania Hollywood in July 2015 while filming a music video for her song “New Love.” A few quick glimpses of the tattoo session are shown in the video.